I used to eat fairly strictly paleo before going vegan, so the pegan bar (paleo and vegan) caught my eye when looking for protein bars. I’ve tested several at this point, and wanted to see how the pegan bar stacks up. Each bar I review is scored out of 30 overall, with individual scores out of 10 for protein content, taste, and price. I’ll walk you through the most important things to know about the Pegan bar if you’re considering trying it. 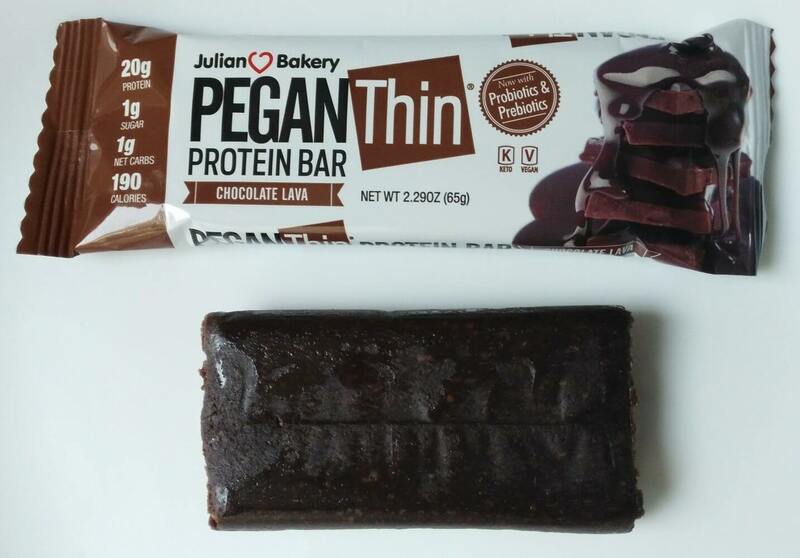 Of all the bars I’ve looked at, the Pegan bar has the highest protein content of all of them. That means that 42.1% of the calories come from protein. Only a few other bars come even close to that. The protein mainly comes from the “sacha inchi,” which apparently is a type of mountain peanut. The other aspect that stands out are the probiotic ingredients, which leads to the veryhigh amount of fiber in this bar. How Does the Pegan Bar Look and Taste? I’m not sure why they don’t use a smaller one. It looks a bit shiny there, that’s because it’s fairly oily on the outside. You don’t really want to be handling it. That doesn’t matter too much, just a note. It looks pretty good at first glance to me. I expected it to be fairly doughy and chewy based on seeing it. What about the actual taste though? I bought 2 different flavors and had mixed experiences. The first one was Sweet Sunflower, and I was not a fan. It was edible, but a bit of a struggle. It would be a 4 out of 10 for me. But I also had the Chocolate Lava bar to taste, and liked it a lot more. Small bar, oily on outside. Flavor is decent, very little sweetness, but a little strange at first. You’re probably not going to love it, it’s far from a candy bar. However, it’s easily edible and there’s no real struggle. That’s why I gave this bar a 7 out of 10 for taste. I’d probably recommend trying the chocolate first, and if you really like it, maybe try others. Is the Pegan Bar Affordable? If you buy a box with no discount, it’ll work out to somewhere around $2.5 per bar depending on the day. For a vegan protein bar, that’s almost dead average. I use a basic formula to scale the price per 10 grams of protein to a score out of 10, where a higher score means that it costs less. In this case, the Pegan bar scored 9/10. In terms of maximizing how much protein you’re getting, it’s a very cost-effective option. It’s not hard to get fats or carbs elsewhere. So, Is the Pegan Bar the Best Vegan Protein Bar? There’s a lot to like about this bar. However, with an overall score of 26/30, the Pegan bar isn’t quite the best overall vegan protein bar (although it ranks pretty highly). If you’re looking for a protein bar to help hit high protein targets (maybe vegan protein powder isn’t an option), the Pegan Bar is the best choice for you.